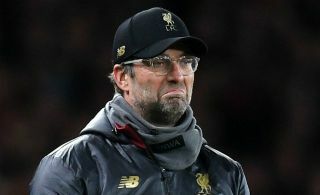 Liverpool face West Ham United on Monday night, with Jurgen Klopp hoping to see his side go five points clear of rivals Man City with a win. The reigning champions closed the gap with their victory over Arsenal on Sunday, and so now the pressure switches to the Merseyside giants to respond. With that in mind, it comes as no surprise that Klopp has gone with a strong starting line-up, as seen in the club’s tweet below. The Reds were rocked earlier on Monday with the news that Joe Gomez will have to undergo surgery, as noted by BBC Sport, and so they’ll hope that the options still at Klopp’s disposal are enough to maintain their impressive defensive record. Liverpool have conceded just 14 goals in 24 league games so far this season, but after shipping three against Crystal Palace last month, they now have to bounce back from the disappointment of being held at home by Leicester City last time out. With that in mind, the usual attacking trident of Mohamed Salah, Sadio Mane and Roberto Firmino will lead their charge. However, there are three injury concerns for Klopp as his headache worsens, with Jordan Henderson, Dejan Lovren and Georginio Wijnaldum all ruled out, as per the tweet below. In turn, there’s a rare start for Adam Lallana, while James Milner continues at right back. The mounting list of absentees will be a concern for Liverpool, but the focus for Monday night will be ensuring that they return home with a positive result.